Gorilla Grolifhar is an original character. He was invented for WORG contributor Chris Cottingham’s campaign setting, Universe 3001. Well, he’s not entirely original. 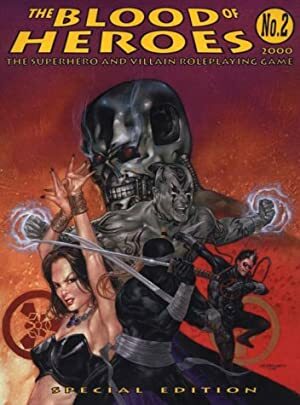 While I was doing some thought experiments on potential non-human Legionnaires, Seb posted his fun writeup of the Gorilla Knights from Gail Simone’s Wonder Woman. This profile has been percolating in the back of my mind ever since. Therefore, lots of the text is, er, ’adapted‘ from the Gorilla Knights. 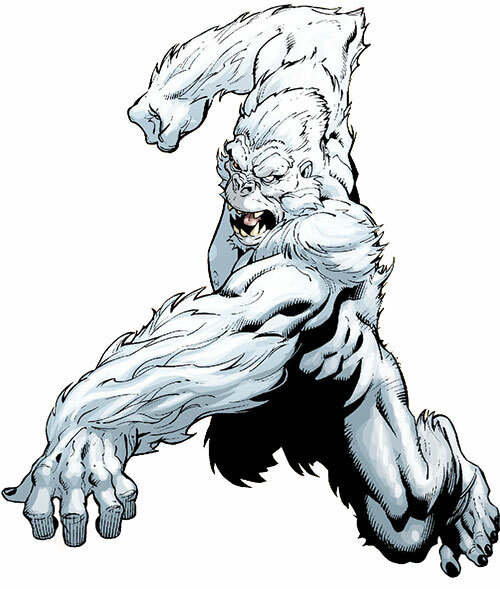 Known Relatives: Cousin to Gorilla City’s king and immediate family; distant descendant of Gorilla Grodd, King Solovar, and Caesar. Group Affiliation: Legion Academy Class of 3003. Grolifhar is a superior specimen of super-intelligent ape from Gorilla City. Like any gorilla, he has an acute sense of smell, massive muscle tissue, and a facility for climbing. But like the rest of his uplifted kin, Grolly is unusually large and has supersimian strength, durability, and psionic powers. The young gorilla’s “super-simian strength” is even greater than his telekinetic strength, and he also has considerable durability. Even state-of-the-art phaser rifles at close range will likely not kill him with the first volley. But he will certainly feel the blast and may be wounded by it. His powers are in the upper 0.03 percentage of all recorded citizens of Gorilla City in the last 1200 years. That makes his potential roughly equivalent to his most noted forbears, the infamous Gorilla Grodd and the heroic King Solovar. Grolifhar is a telepath able to engage in two-way mental communication (Telepathy, in DC Heroes RPG terms). The force of his mind is such that he can warp someone’s perceptions, altering what they see, hear, and smell (Mental Illusion). He can also control another’s thoughts and actions through sheer mental strength. He is still learning delicacy of touch. Right now it is easier for him to seize another’s mind (Control) than it is to sift through their thoughts and probe for information (Mind Probe), though that’s certainly possible for him. Perceiving strong emotions and surface thoughts comes naturally to him (Empathy). Telekinetically, Grolifhar can shift upwards of 50 tons of materiel (Telekinesis). He’s also practiced at deflecting attacks (Force Shield) and directly damaging targets with beams of force (Mental Blast). Telekinetically agitating molecules also makes him a firestarter (Pyrotechnics). Gorilla Grolifhar has been training since the age of two in warfare and the sciences. Despite his youth, he has most of the skills of a professional, well-trained Gorilla City soldier and scholar. Given his crushing strength, Grolly prefers close combat most of the time. His martial training includes the use of polearms and the occasional bite attack (and his fangs can punch through steel). When he’s allowed to, he uses an advanced steel alloy spear with an energy blade. This is standard issue for elite Gorilla City warriors. But Grolifhar’s is specially made to accommodate his superior strength. With it he can shatter a foot thick steel wall with a single blow. Legion Academy training generally focuses on non-lethal combat techniques. But Gorilla City martial traditions demand that Grolifhar maintain his early arms training. Therefore, he tends to use melee weapons for solo combat sessions but go unarmed during group training. He also has custom-fitted body armor. He doesn’t typically wear this during his normal classwork at the Academy. Grolifhar’s quarters are equipped with a Transporter. It is designed for one-way use only, but allows instantaneous travel to and from Gorilla City. However, Grolifhar secretly overrode the safety protocols and reconfigured the Transporter within his first 36 hours at the Academy. It can now send him virtually anywhere on Earth — at least locations that are not secured to prevent beam-in. Gorilla City has an unusual place within Earthgov and the broader Federation of United Planets (UP). The Gorilla Nation has a high degree of autonomy. It participates within the united Earth government, sending representatives to the Legislature, and is somewhat integrated within Earth society. There are, for instance, many gorilla scholars at Metropolis Multiversity, and Gorilla City is a major tourist destination. The sovereigns of Gorilla City and Themyscira both accept the authority of the President of Earth. Thus, they function more as regional governors than independent potentates. But the Kingdom of Gorilla City maintains a high degree of autonomy, the panoply of royalty, and a hereditary rather than democratically elected chief executive. Most of the (still mostly human) Earthgov politicians, like Terran humans generally, are not sure Gorilla City should retain such autonomy. Most don’t care for the fact that Gorilla City is one of the least racially diverse corners of the United Planets. The population consists almost entirely of Uplifted Gorillas. Most of these are descended from the original inhabitants of the City. Some are descended from gorillas uplifted following the last World War in the 26th century. There are a smattering of humans who live in the City. These are mostly students or scientists who stay a few years and then move away. A small community of uplifted chimpanzees live there, as well as a community of B’rk Monks. The latter descended from the experiments of Dr. U’bx in the 20th century. More than 90 percent of the population, though, are gorillas. But despite its oddities, Gorilla City has clout. It is the center of two waves of interstellar colonization. The first group fled Apocalypse in the 26th century. The second, larger wave of colonization followed the Great Wars of the 28th century. There are ape communities on several UP worlds, most prominently Vulcan, Vorn, and Ventura (the alliteration is coincidental). Two gorilla colony worlds, Boulle and Schaffner , have achieved independent status as full UP member worlds. These communities collectively refer to themselves as the Gorilla Nation. Though they are not politically ruled from Gorilla City, they have deep cultural and religious ties to their ancestral home. This gives the sovereign of Gorilla City considerable diplomatic weight. Reports in recent years (since the birth of Gorilla Grolifhar, in fact) of unrest and religious assassinations within Gorilla City therefore have broad political implications. Both Earthgov and the UP Council are monitoring events with concern. Gorilla Grolifhar is an intelligent male gorilla from Gorilla City. Born to a collateral branch of the royal family in 2993 C.E., Grolifhar’s white fur had him hailed at birth as an Nzame. Meaning a rare white gorilla whose like shows up only once or twice in a millennia. Gorilla society has many, often conflicting, religious beliefs and prophecies surrounding the birth of an Nzame. Most are of a fairly apocalyptic nature, with the Nzame’s birth heralding an era of destruction and change. The major sects within Gorilla City (and its several colony worlds) believe that an Nzame is a gift. They’re a messianic figure who will bring the Gorilla people through a time of testing into an era of greater glory. There are at least two sects, however, that believe the Nzame is itself the danger the Gorilla-folk will have to face. And one of those is willing to stoop to assassination to end the threat. This group, the Sons of Solovar, points out that Grohlifhar’s royal blood is “tainted,”. Their reasnoning being that it was mixed two generations back with a descendant of Grodd. Moreover, they point out that there was no Nzame born even during the upheavals of the 26th century, when the forces of Apocalypse laid waste to Gorilla City during World War V. If, they reason, the Nzame Grolifhar heralds a danger greater than that of Apocalypse, it could mean the end of the Gorilla Nation. Even many followers of the majority Gorilla religion are disturbed by that logic. They wonder how many will be lost before Grolifhar leads the survivors to glory. Grolifhar is a matter of concern, an object of veneration for most, of fear and loathing for a few. Regardless of the truth or falsehood of any of these prophecies, the quietly secular royal family finds Grolifhar…trying. His birth created controversy and division amongst the usually rational populace. It had ripples throughout the UP far in excess of what might be expected. For many Terran politicians, both gorilla and human, an Nzame is an unwelcome complication to an already complex power structure. Unfortunately Grolifhar seems to have bought into the hype. He sees himself as the future savior of Gorillakind, and is overly impressed by his unusually strong innate powers. He is arrogant, has entitlement issues, and is hard to manage. Nevertheless he is a royal, and must be protected. His personal powers trained and channeled as a resource of the Gorilla Nation. Grolifhar has therefore been surrounded by elite soldiers and scholars all his life — protecting him, training him, disciplining him, and in his words, stifling him. He began testing the limits a few years ago, and his discontent and his king’s irritation have both been growing. Above all else, the king wants the young Nzame not to make waves, so as to calm the populace, and Grolifhar’s just not good at that. In the year 3000, the Dominion’s secret infiltration of Earthgov was exposed. Months of intense fighting broke out as the Dominion was forced off Earth. During the fighting a group of Dominion and Earthgov soldiers sought to occupy Gorilla City. A team of Legionnaires was sent to assist the embattled gorillas. Grolifhar witnessed the fighting, and an idea was born. After the expulsion of the Dominion from Earth, Grolifhar requested that he be allowed to attend the Legion Academy. There he could gain specialized superpower training beyond what he could receive in the City. The Legion’s aid to Gorilla City had won them enough credibility and popularity that the king did not dismiss the idea out of hand. Grolifahr also pointed out to his royal cousin that sending him to the Academy would get him away from court, out of sight of Gorilla society, and away from the factions surrounding him. After weeks of negotiation, the king agreed. The Academy then accepted Grolifhar’s application for membership. Grolifhar’s interviewers (Bouncing Boy and Duplicate Girl) recognized the young gorilla’s arrogance and that he was more interested in escaping his home life than in learning at the Academy. But they saw potential in him, and saw too that he was lonely and angry. He needed a different, more nurturing, yet more challenging environment. So they admitted Grolifhar as a student and agreed to the special arrangements demanded by Gorilla City. Special accomodations for individual students aren’t particularly unusual at the Academy. It has at times had students who needed constant life support in Earth’s environment. In Grolifhar’s case, the GC Sovereign insisted on the installation of a specially modified personal Transporter in Grolifhar’s quarters. This transporter was hardwired to allow transport only between those quarters and the royal palace in Gorilla City. The transporter is intended to allow Grolifhar to attend to ceremonial duties at home. But it’s also for emergency evac to the City should the Academy come under threat from Legion enemies. It was also stipulated that Grolifhar would not be risked in combat with such enemies, and as such would not function as part of the Legion Reserve, as most advanced Academy students do. Grolifhar matriculated with an unusually gifted class of students (including Powerpax, Gravity Kid, Dragonwing, Chemical Kid, Alchemy Girl, Variable Kid, Kid Karma, and others). Initially this did little to temper his arrogance — Grolifhar is clearly the most powerful student at the Academy, perhaps the most powerful they have ever had. Moreover he has generally expected others (teachers as well as students) to treat him as royalty. Integrating with his classmates has been difficult, especially since he seems uninterested in doing so. He finds their insistence on calling him “Grolly” particularly offensive and undignified. Moreover he chose to behave as a law unto himself. “Grolly” was dismissive of his instructors, waved away their rules, blew off classes when he felt like it. He also routinely left the Academy grounds without permission, having reprogrammed the emergency transporter provided by Gorilla City so that it was capable of beaming him around the planet whenever he chose. His instructors, when they discovered this, chose to deal with Grolifhar personally, rather than telling his superiors in Gorilla City. Rather than confront the rebellious and aggressive young gorilla and play into a dominance hierarchy, Bouncing Boy and Duo Damsel set out to teach him humility in a subtle fashion. They brought in guest teachers to test his telepathic techniques. Encounters with Proty 2 and Tellus went smoothly but he found himself stymied and embarrassed after his sessions with Saturn Girl. He has grudgingly begun to accept that Titan may truly be the home of the UP’s most powerful telepaths, despite official demurrals from Gorilla City. He has begun to learn defensive telepathic exercises from Saturn Girl, but his progress at learning to close his mind has been slow. Grolly found his first private tutoring session with Brainiac 5 even more troubling. Grolifhar expected the Coluan’s vaunted “11th-level intellect” to be of little account beside his super-simian brain. Frustrated at being unable to follow Brainiac 5’s discussion of theoretical chronal astrophysics, Grolifhar mind-probed the Legionnaire. This direct encounter with the full force of Brainiac 5’s intellect left Grolifhar profoundly shaken. Initially the result of these encounters was an increase in bravado from “Grolly”. But he seems to have reached a turning point during a recent attack on the Academy. Students Dragonwing and Chemical Kid had defected to the LSV and sabotaged the security systems. LSV members attacked in order to secure their two new members and do whatever quick damage they could to the Legion’s training facility. According to the agreement between the Academy and his king, Grolifhar is supposed to evacuate his royal personage to Gorilla City in the event of danger. His family wants him out of the public eye, not engaged in actual super-heroics where he (and his powers) will be at risk. Grolifahr ignored this, rationalizing that he was a warrior and that he had never verbally consented to that part of the deal. Thus, he overconfidently rushed into the fray. Only the quick-thinking of his classmates Variable Kid and Kid Karma, under Bouncing Boy’s direction, saved Grolifhar from being vaporized by Cosmic King. And it was the very young and annoying (to Grolifhar) Powerpax who saved them all from Lightning Lord and Lady Lightning. Grolifhar was forced to see the worth of his classmates — and to acknowledge his own limitations. He still tried to take charge when a Legion team led by Cosmic Boy arrived to repulse the LSV, but was fairly gracious when Cosmic Boy shut him down. He followed orders and helped to finish driving the LSVers off. Grolifhar’s participation in the battle had some political fall-out, as he was never supposed to be in the line of fire. But Grolifhar took full responsibility for his actions. He also gave full credit to his teachers and fellow students for keeping him safe. He flatly refused any suggestions from Gorilla City that he should quit the Academy and come home. To strongly worded missives from Gorilla officials over the Academy “endangering” him, he replied with fiery retorts and glowing rhetoric about the Legion’s heroism and valor…and the importance of what they could teach him. In a private conversation with his king, who accused him of insubordination, he actually sort of apologized. Grolifhar explained that he was only beginning to learn what the Academy had to offer. Grolifhar still tries to take charge of his classmates, and he’s still rather pompous with his teachers. But he’s stopped protesting overmuch when his classmates call him “Grolly”. And he’s taken to allowing a few of them to accompany him on some of his “unofficial off-site field trips”. Moreover, he’s stopped skipping classes and is applying himself in training exercises, having seen the effectiveness of Legion training and teamwork. Grolifhar is a young, not fully mature, but still massive white gorilla. Grolly is an intelligent gorilla, not a human in a fur suit. The Super Apes of Gorilla City are still gorillas, and they do not consider themselves to be profoundly different from normal apes. For instance, they fight with animalistic ferocity, and they go through dominance rituals to establish hierarchies. Still, in the opinion of the locals, Gorilla City is more advanced than nearly any other place on Earth. Moreover, Grolifhar (he doesn’t actually like anyone using a diminutive of his name, as it’s beneath his dignity) is a noble, a Royal, and a sacred, almost messianic figure. He’s fairly decent at heart, but he’s been conditioned since birth to believe himself to be the most important sentient in any room. He often acts like a mix of rich tourist and condescending noble, obligated to instruct and protect lesser beings. Like most Gorilla City residents, Grolly is clearly smarter than the average human. Grolifhar is well-read and very articulate, but full of youthful arrogance. Encounters with some Legionnaires, especially Saturn Girl and Brainiac 5, have begun to teach him humility. Until now, he’s had no close friends. In a society that is extremely collectivist in its mindset, with a pack or tribal culture, everything has emphasized his separateness. He’s been too important to be allowed play or normal socialization with peers his own age. His tutors are constantly on their dignity, and trying to make him be on his. Some of them consider him trying; others are too in awe of his significance to treat him familiarly. And the common people generally treat him with awe, except for the small segment that view him with fear and hatred and occasionally try to assassinate him. Even in his family, he’s not at home. The mostly secular royals find his existence as a living warning of apocalypse and prophecy to be inconvenient. Though trained to fight, and with instincts to establish himself as an Alpha Male, he’s forced to suppress those, since he’s neither the king nor the heir to the throne. He doesn’t want to seem to challenge them, despite clearly being stronger and more powerful than they. He’s thus been isolated with no clear place in ape society. His small rebellions and tantrums in recent years are thus completely predictable and normal. But they are still signs of a social maladjustment that might easily have gotten out of control, as happened to his ancestor Grodd. It’s in this context that his attendance at the Legion Academy has proven critical. Bouncing Boy and Duo Damsel recognized the warning signs, signs they remember from their service in the early LSH alongside Kal-El of Krypton. Like the young Superboy, Grolly is for the first time dealing with other young sentients who, in their own ways, are exceptional. Moreover they see that specialness as a gift, a joy, and a calling. As he’s begun to learn respect for his classmates, he’s begun to take on that attitude, perhaps without realizing it. For the first time he’s in an environment where he doesn’t overawe his peers. Grolly’s beginning to unbend and even “play” more. This mostly manifests in trash-talk, name-calling, and practical jokes, but he’s beginning to fit in with his classmates. The huge gorilla and the diminutive Powerpax are becoming quite a team, both in training exercises and in mischief. One other quirk worth mentioning is the attitude of Grolly, and most residents of Gorilla City, for the House of El. 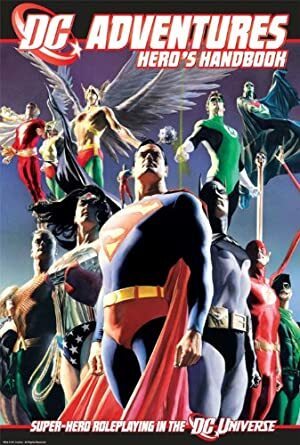 Most of 31st century society (on Earth and throughout the Federation) thinks of Superman as history’s greatest hero. The Super Apes of Gorilla City likewise respect Superman, but they believe that his line has decayed over time. Many of them feel disdain for latter scions of the El family (most of whom aren’t publicly known anyway), dating back to their unfortunate encounters with the family during the 26th century wars with Apocalypse. Grolifhar himself has met Superman during one of the Kryptonian’s recent time jaunts to the 31st century. Grolly was reasonably polite and respectful. But he didn’t show the awe that most Terrans and even most Legionnaires feel for the Man of Tomorrow. Instead, Grolly seems to think that a Superman is almost on par with a super-gorilla. Int: 09 Wil: 07 Min: 06 Occupation: Prophet-in-training? Analytical Smell/Tracking Scent, Density Increase and Growth are Always On, Already Taken into Account and Form Function. Control, Empathy, Mental Illusion, Mind Field, Mind Probe, and Recall are Derived from Telepathy (-1 each). Force Shield, Mental Blast, and Pyrotechnics are Derived from Telekinesis (-1 each). Area Knowledge (Gorilla City), Familiarity (Gorilla City military equipment and protocols, Jungle survival), Genius, Local Hero (Gorilla City and its colonies). Gorilla City government (High), Legion Academy (Low). Distinct appearance, Partial Attack Vulnerability (-2 CS RV against scent-based attacks). Grolifhar possess a large energy-bladed spear; this is standard issue for elite Gorilla City warriors, but Grolifhar’s is specially made to accommodate his superior strength. [BODY 14, EV 05 (13 w/STR), Sharpness (EV): 03]. Academy students generally concentrate on use of their powers with only a basic arms course, but Gorilla City martial traditions demand that Grolifhar be well-acquainted with arms. He tends to use the spear for solo sparring but goes unarmed during group training. He also has custom-fitted BODY ARMOUR [BODY 12, Skin Armor: 01, Limitation: Skin Armor cannot raise any RV above 12]. He doesn’t typically wear this during his normal classwork at the Academy. Grolifhar’s quarters are equipped with a Transporter. Hardwired to allow transport only to and from Gorilla City, Grolly secretly overrode the safety protocols and reconfigured the Transporter. It can now send him virtually anywhere on Earth — though getting back is an issue unless he recruits help from fellow students. Helper(s): Sébastien Andrivet for his writeup of the Gorilla Knights; Frank Murdock for encouragement and editing; Andrew Lee (for an Easter Egg he probably won’t notice). Writeup completed on the 22nd of August, 2013.